A gel cap for beef and dairy cattle that supports digestive health and promotes feed and water intake during times of stress and recovery. 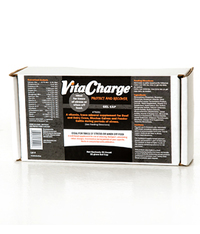 Provides a jump start to the digestive system to protect cattle during stress. Formulated to help cattle recover quickly. Does not interfere with antibiotics. Contains Amaferm® to support the animal’s ability to recover from the effects of stress resulting in increased intake and nutrient digestion. Includes vitamins and B vitamins. Administer to cattle based on the following: Cattle over 450 lbs. : One (1) gel cap daily, as needed. Cattle over 1000 lbs. : Two (2) gel caps daily, as needed. Administer with proper procedure noting animal's ability to accommodate bolus size. Not for calves less than 450 lbs. Monocalcium Phosphate, Dicalcium Phosphate, Dried Aspergillus oryzae Fermentation Product, Potassium Chloride, Sucrose, Niacin Supplement, Vitamin D-3 Supplement, Yeast Culture, Calcium Carbonate, Sodium Selenite, Zinc Sulfate, Vitamin E Supplement, Manganese Sulfate, Mineral Oil, Vitamin A Supplement, Copper Sulfate, Choline Chloride, Cobalt Carbonate, d-Calcium Pantothenate, Riboflavin, Vitamin B-12 Supplement, Thiamine Mononitrate, Calcium Iodate.